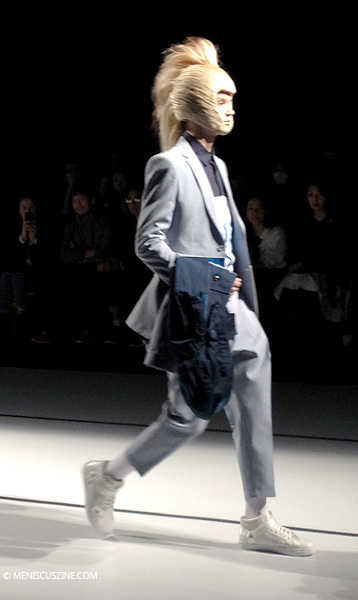 Yoshio Kubo’s fun Fall 2014 menswear show at Tokyo Fashion Week included two live DJs seated at the head of the runway; awesome hairstyles such as cartoonish wigs and dreads; and clever layering that showed off the details of the clothing. The first outfit on the runway included a two-toned suit jacket with a jacket thrown over it that appeared to be made of three different types of material. High tops were paired with skinny suit pants or biker leggings, while more avant garde pieces featuring a graphic suit and ponchos. Dominant colors included grays, blues, whites and orange/red. 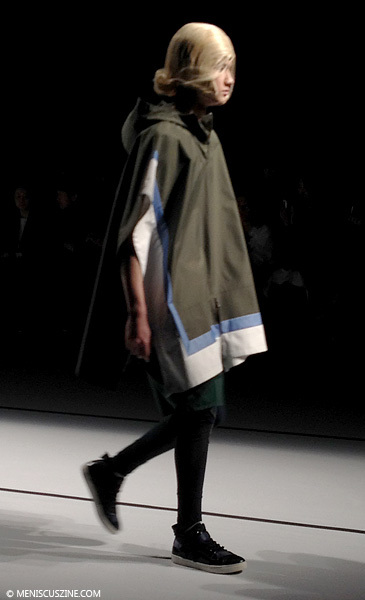 For more information about the label, go to www.yoshiokubo.jp.